Kingdom protista (Gr. Protistas - first of all) includes unicellular and colonial eukaryotic, auotrophic and heterotrophic organisms. 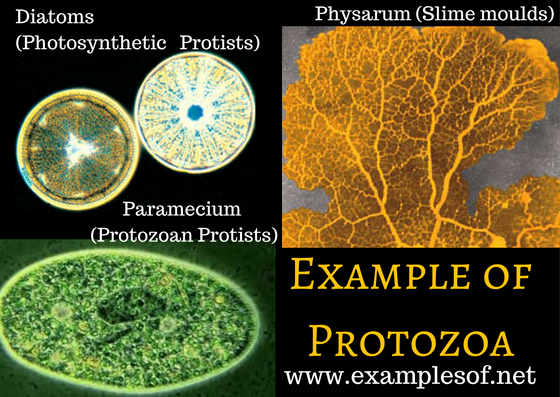 They are broadly divided into three groups: photosynthetic protists (protistan algae), slime moulds (myxomycetes) and protozoans protists. 1. 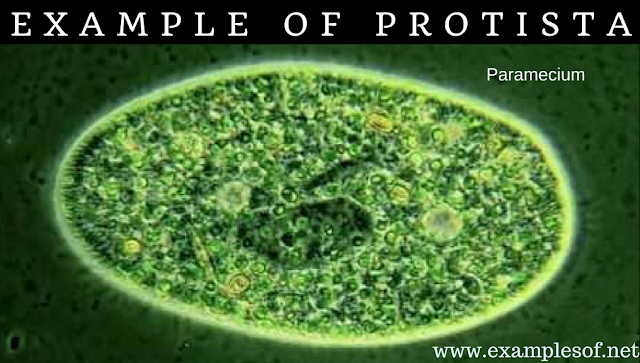 Example of Photosynthetic Protists: Photosythetic protists are photoautotrophic like diatoms, dinoflagellates and euglenoids. Dinoflagellates: Ceratium, Glendinium, Gymnodinium and Gonyaulax. Diatoms: Navicula, Nitzchia, Melosira, Cymbella and Pinnularia. Euglenoids: Euglena, Phacus, Peranema and Eutreptia. 2. Example of Slime moulds: Slime moulds exists in two types: cellular and acellular. Amoeba, Entamoeba, Giardia, Plasmodium, Paramecium, Leishmania and Trypanosoma.